Recruiting is really heating up in Knoxville now that the season has come to a close and the early signing period is later this month. The Vols have made several headlines this past week, and Sunday the Vols found themselves in the top eight for a sneaky-good defensive lineman out of New York. Jared Harrison-Hunte, a three-star 2019 prospect, released his top eight schools Sunday evening via twitter, and the Vols made the cut. 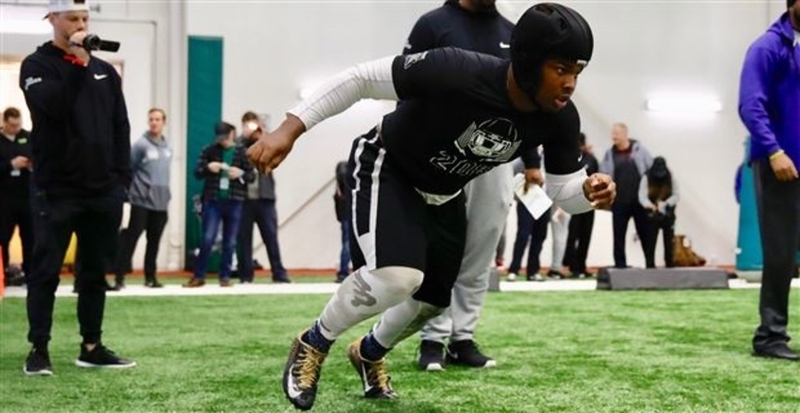 Arizona State, Rutgers, Ohio State, Penn State, Miami, Michigan State, and Texas A&M were the other seven schools to make Harrison-Hunte’s list. Penn State and Ohio State are currently seen as the favorites in his recruitment, but he’s still very much open to every school on his list. Harrison-Hunte is currently ranked by the 247Sports Composite rankings as the 548th-best player in the country and the 4th-best player in New York. Additionally, he is the No. 35 defensive tackle in the 2019 class. Harrison-Hunte is from Middle Village, New York. He earned an offer from the Vols after having a great camp this past summer in front of UT’s coaches. The 6-foot-4, 286-pound prospect blew up the summer camp circuit. He attended camps at and subsequently received offers from Penn State, Georgia, and Ohio State as well. He holds offers from more than 20 schools, including LSU and Michigan State among others. He visited Knoxville for the Vols’ game against Missouri this season. New York is relatively unfamiliar territory for the Vols in recruiting. Not one player on UT’s current roster is from the state, and Jeremy Pruitt and Kevin Sheerer never signed a player from New York in their previous coaching stops. Ohio State, one of the main schools they’ll be recruiting against, signed the top two players in New York in 2018. Get all of our in-depth recruiting analysis, interviews, and podcasts by becoming a member of RTI Premium today! Harrison-Hunte is an athletic player, occasionally lining up at tight end as well as defensive tackle for Christ the King Regional High School. He has good size for his position but not too much weight to make him unathletic. Right now, Harrison-Hunte doesn’t have much film online because he hasn’t been playing football for very long. Even from that little bit of film, though, his talent is evident. He moves exceptionally well for his size and is a physical player. He is a pretty solid blocker as a tight end which shows that he is good at the point of attack. It wouldn’t be out of the question for him to change positions in college. If he were to slim down some and gain some lean muscle, he could make for a good tight end prospect. He could also move outside on the line and play defensive end. He’s an exceptional defensive lineman as well, however. Harrison-Hunte is explosive and navigates the line of scrimmage very fluidly. He does a good job getting leverage and getting off blocks, and he is very skilled with his hands. The improvement he has shown from his junior year to his senior year is remarkable, and there is a reason that several elite programs are after him. Harrison-Hunte is a versatile player as well, and he gives coaches plenty of options. He is not your typical space-eating defensive tackle. He can make plays in the run game and as a pass rusher. He is comfortable flexing out to a 3 technique or even all the way out wide as a defensive end. He is certainly one of those players that coaches feel they’ll have the ability to develop. In eight games in his senior season, Harrison-Hunte totaled 45 tackles and three sacks according to MaxPreps. His recruitment will likely come right down to signing day, and his decision could very well be impacted by which schools have space for him in their class. Tennessee could certainly use his services, especially if they miss on some higher priority targets.